Season 1998/99 found Partick Thistle in the slightly shabby (for them) surroundings of the Scottish League’s third tier; the club having suffered two relegations in three seasons. Hoping to make their spell in the lower echelons as brief as possible, the Jags had made a decent start to their campaign, with this match finding them sitting handily placed in third. 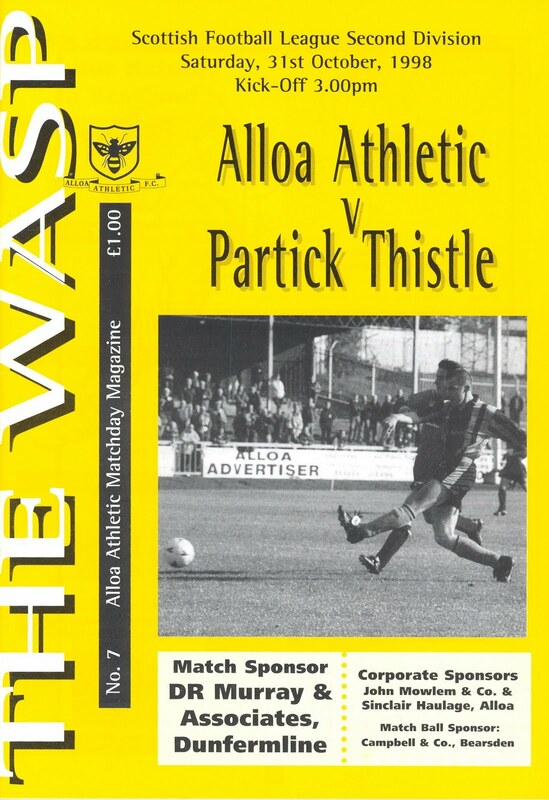 The largish Thistle support looked full of optimism that this trip to recently-promoted Alloa Athletic would yield a further three points to keep their club on the tails of leaders Livingston. And I have to say I thought they looked a good bet for promotion. How wrong can you be? For those self-same Jags’ supporters were made to scuttle back west with their collective tail between their legs following this comprehensive bashing. Defensive frailties led to both of Alloa’s first-half goals, with their forward Paul SIMPSON at the heart of both. First he headed on a long throw-in to his manager Willie IRVINE who tapped-in, before he was left unmarked at a corner-kick to net one for himself. Thistle did swiftly pull one back, when that Man of many clubs TRIALIST chipped a neat one over Alloa ‘keeper Mark Cairns, but seconds before the break the homesters regained their two goal cushion through Martin CAMERON, after Stevie Ross in the Thistle goal had let spill another Simpson effort. Alloa sat in somewhat during much of the second-half but Thistle’s attack was so impotent they rarely penetrated the home defence, and were compelled to rely on long range shooting - (too many sexual metaphors there, maybe?). It is probably over stating things to suggest Partick’s promotion drive was fatally derailed at Recreation Park this particular afternoon, but this defeat heralded the start of a run of five league defeats on the trot, and come May the Jags only just avoided the ignominy of another relegation by the skin of their teeth. Alloa goalmouth here, in the absence of any Partick forwards. I am guessing there is one hidden behind the sub. 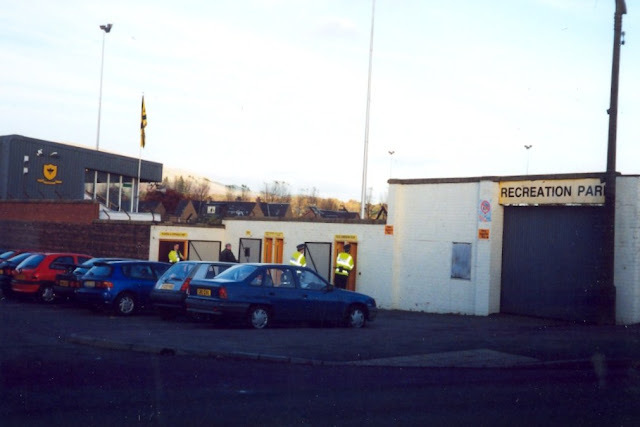 Panorama of Recreation Park, Alloa. since I last visited Recreation Park. the two fences. I assume one was keeping the other from falling over. Looking North towards the picturesque Ochil Hills. From the main stand looking South. 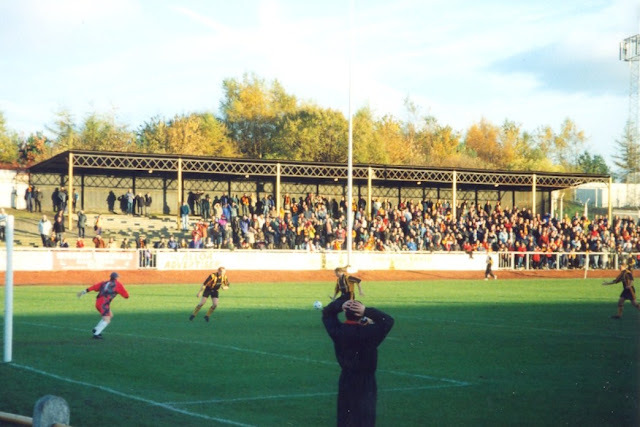 From the main stand looking North. Castleview lift the 2011/12 Donald McNair Scottish Welfare FA Cup.